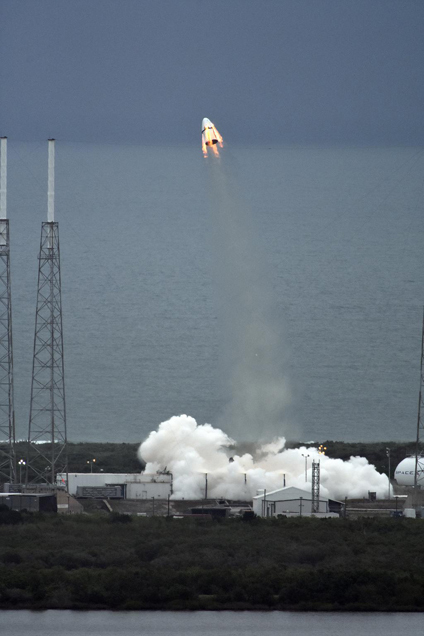 Simulating a launch pad emergency, an unmanned SpaceX Dragon capsule was blasted away from Cape Canaveral Wednesday, shooting to an altitude of several thousand feet before arcing over for an offshore splashdown in a dramatic test of the emergency escape system planned for the company's space station crew ships. "This bodes quite well for the future of the program," company founder Elon Musk said after the test. "I don't want to jinx it, but this is really quite a good indication for the future of Dragon. ... Hopefully within two years, we'll be transporting crew to and from the space station. We're really looking forward to it, it's going to be super exciting." Eight SuperDraco engines mounted in pairs around the base of the eight-ton capsule ignited at 9 a.m. EDT (GMT-4), reaching a combined thrust of 120,000 pounds and boosting the spacecraft from zero to 100 mph -- straight up -- in 1.2 seconds. Quickly climbing away from the Cape Canaveral Air Force Station, the SuperDracos burned for just five seconds or so, pushing the craft to a velocity of about 345 mph, fast enough to push the craft away from an impending booster failure in an actual launch attempt. The acceleration subjected an instrumented dummy to about five times the force of Earth's gravity. After the engines shut down, the capsule continued climbing, coasting to an expected altitude of about 4,500 feet on an arcing trajectory carrying it just over the coastline from launch complex 40. At the apex of the arc, the Dragon and its finned trunk section separated as planned. 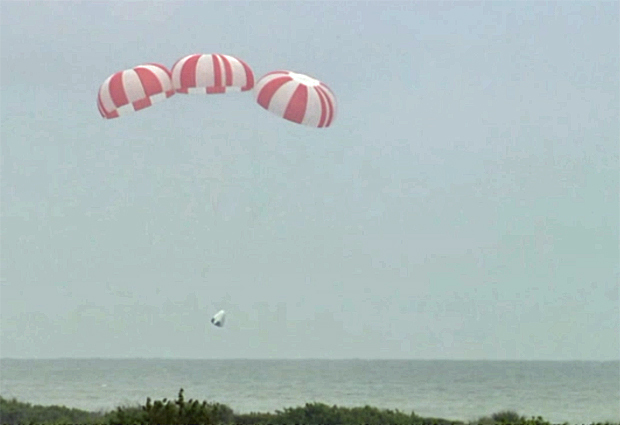 The Dragon capsule immediately flipped around, going through a full 360-degree rotation, before two small drogue parachutes deployed to stabilize the vehicle. A few seconds later, three orange-and-white main parachutes unfurled, gently lowering the spacecraft to the Atlantic Ocean just off shore. SpaceX recovery crews were standing by to pull the capsule onto a waiting barge for the short trip back to port and eventual shipment to a SpaceX facility in Texas for detailed inspections. "I'm very proud of the SpaceX team for achieving this," Musk said during a brief teleconference. "This was quite a complicated test, and huge credit to the engineers and technicians involved who made it happen. ... It was a great outcome." Musk said he had not yet seen detailed telemetry, but "had there been people on board, they would have been in great shape." SpaceX has a $2.6 billion contract with NASA to develop a piloted version of its Dragon cargo ship to ferry astronauts to and from the International Space Station starting in 2017. Boeing holds a similar contract, valued at $4.2 billion, to build its CST-100 ferry craft. A key element of both vehicles is the escape system, designed to quickly boost a crew to safety at any point from launch to orbit. While a detailed data review and vehicle inspection will be needed to fully assess the results of Wednesday's test, it appeared to go smoothly and no major problems were apparent. Musk said one of the eight SuperDraco engines was "slightly off" due to a propellant mixture issue, "but not in a way that materially affected the flight." SpaceX plans to use the same capsule later this year for an in-flight abort test, launching the craft atop a Falcon 9 booster and activating the escape system at the moment of maximum aerodynamic pressure, the most challenging flight regime during ascent. The tests are needed to certify the escape system for use with eventual crewed missions. NASA's Mercury and Apollo spacecraft featured tower-mounted escape rockets designed to pull a capsule to safety while two-seat Gemini capsules relied on ejection seats. Russian Soyuz ferry craft, which currently carry astronauts and cosmonauts to and from the space station, also are equipped with a rocket-powered escape system attached to the front of the spacecraft. NASA's space shuttle was equipped with ejection seats for the first four test flights when only two crew members were on board, but the system was deactivated and removed for "operational" flights. While a rudimentary bailout system was implemented in the wake of the 1986 Challenger disaster, there were no survivable abort options for booster failures in the first two minutes of flight. But NASA's new crew ships -- the agency's Orion deep space exploration vehicle and the Boeing and SpaceX space station ferry ships -- are being designed from the ground up with escape systems that could pull or push a crew to safety at any point from launch to orbit. The powerful SuperDraco engines built into SpaceX's crewed Dragon capsules will serve a dual purpose. SpaceX eventually plans to use them for rocket-powered vertical touchdowns on land at the end of a space station mission. But the same engines also are available for quick use if a major problem develops during launch atop a Falcon 9 rocket. "We're proud to have a launch escape system in case the Falcon 9 is having a bad day," said former shuttle astronaut Garrett Reisman, director of crew operations for SpaceX. "The Dragon crew can get to safety. "It's a capability we had on Gemini and Apollo, and we have it on the Soyuz, but we did not enjoy that on the shuttle. We're bringing that back to try and make sure our crews are super safe." For Wednesday's test flight, the Dragon test article was heavily instrumented with sensors to measure multi-axis acceleration, temperature, sound, pressure and a variety of other factors. An instrumented dummy was on board to measure the forces astronauts would experience in a launch abort.